Months before, I had published the first of two articles on Drew’s Station. It was at Ms. Lewis’ request that Mrs. Sosa began looking for Drew’s Station for TTR, although members of this group have previously visited the Drew’s Station site that we have endorsed and published. In recognition of this arrangement between TTR Chairperson Lewis and TTR member Nancy Lewis Sosa I will refer to their sites as the “TTR/Sosa site” in this article. Actual robbery site 1.25 miles from Contention. John Rose looks over the TTR/Sosa robbery site 2.15 miles North of Contention. In Mrs. Sosa’s web article she says the following: “Around 10 ‘clock, after leaving Contention, the stage came through a wash and began the short incline to the road about 200 yards from Drew’s Station.” It’s a minor error to say that “the stage came through a wash and began the short incline to the road…” The Epitaph describes this moment a bit differently, as you will see. The road actually went through the wash, so at that point, that portion of the road was in the wash. Although she doesn’t share this in her article, some of her information comes from the March 16th, 1881 Tombstone Epitaph which can be read in its entirety on our Drew’s Station page. That article notes that the wash that Bud Philpot was crossing when he was shot is about one mile “the other side” [meaning north] of Contention City, and that Drew’s Station was about 200 yards from the wash where Philpot was murdered, but Mrs. Sosa omits this very important part of the article. This omission of facts from the same Epitaph article is of serious concern, as this clearly disproves the TTR/Sosa sites. The Epitaph article was based on telegrams from Benson quoting the survivors of that ill-fated trip. The survivors of that trip are Bob Paul, along with everyone else who began the trip, minus Bud Philpot and Peter Roerig, who both died that evening. The Epitaph article is based on these important accounts, and this makes clear that the wash where Philpot was killed is about one mile north of Contention City. There is no doubt on this point, and it is further confirmed by the letter we have published by T.W. Ayles, who was informed of the event’s location that night by none other than Eddie Drew himself, who found Bud Philpot in the wash dead, with his whip still in his hands. Ayles documented this information that same night by writing it into his letter, which was very soon after published in the Epitaph. Ayles’ letter to the Epitaph was dated March 16th, 1881. This primary source, of which Mrs. Sosa uses only a small portion, disproves the TTR/Sosa sites. The Epitaph account of March 16th and the Ayles letter show that the road crossed the wash because the wash intersected the stage road. To continue on their journey from Contention to Benson they had to cross the wash. Otherwise, why leave the road to cross a wash knowing that you come out of it slowly and are vulnerable to robbery and or attack? No one would go out of there way to cross a wash, as the TRR/Sosa sites require. This is why the shooting took place where it did, as the attackers knew where on the route the stage would be the most vulnerable to attack. It’s no coincidence that they chose to approach the stage while slowly coming out of a sandy wash. The first wash north of Contention City is 1/2 of a mile to the north. The second wash north of Contention City is 1.25 miles. The second wash north of Contention has to be where the murder of Bud Philpot took place; we will refer to this wash as “Philpot Wash.” But the TTR/Sosa stage robbery/attack site is located in a ravine 2.15 miles north of Contention, and .9 (9/10) of a mile from the correct site. But the larger problem with the TTR/Sosa robbery site is that their wash/ravine does not intersect the route to her site, it runs parallel to it. For their robbery site to have been used by any stage company, they would literally have to have gone out of their way to go through this difficult terrain, and it’s not even the route of the least amount of distance. The location of Drew’s Station in the Epitaph’s description is actually based on its proximity to the wash where the stage attack took place. To be clear, if you choose a site which is nowhere near the correct wash, then your site is not Drew’s Station. From the Epitaph…“As the stage was going up a small incline [they are climbing up out of the shallow wash they have just entered] about two hundred yards this side of Drew’s Station…” Writing for its Tombstone readership, the Epitaph says “this side of Drew’s Station” which clearly means in the direction of Tombstone from Drew’s Station, which is to the south. So for any site to be Drew’s Station, it has to be reasonably close to Philpot Wash as I have noted, which is 1.25 miles north of Contention City. The adobe wall which is pictured on my Drew’s Station page is 1600 feet from the correct wash, and is only 1000 feet off from the Epitaph estimate of 600 feet (200 yards). But the TTR/Sosa adobe wall is 1 mile (approx. 5000+ feet) from the correct wash. This distance is too far off to make this site even a remote possibility for that of Drew’s Station. Just 370 feet from the TTR/Sosa adobe wall is the foundation pictured below that Mrs. Sosa identifies as Drew's station. But as with the TTR/Sosa adobe, its distance from the correct wash is unacceptably high, measuring almost 1 mile from the correct wash.
What is especially interesting about the area of land from Philpot wash to the TTR/Sosa sites is that there are no intersecting washes in between these points, as the Google earth images below show. The TTR/Sosa robbery ravine site is on the right side of the approach as you hike toward their sites, and it never intersects it, which it would have to in order to fit the Epitaph. Just to the north of their sites is a massive wash which soon empties into the San Pedro. But the wash to the north of the TTR/Sosa site is 1.18 miles from the correct wash, and 2.43 miles from Contention City. The Epitaph states the distance as about one mile. The above satellite photo shows the positions with GPS coordinates based on extensive ground research efforts over many years. The ill-fated Kinnear & Company Stage departed from Contention heading to Benson, and crossed "wash #1"(one 1/2 mile north of Contention) on it's way to the second wash north of Contention, which I refer to (but maps do not) as Philpot wash. "Philpot wash" is the second wash north of Contention to intersect the original Stage road when traveling north from Contention to Benson, and is 1.25 miles north of Contention. Note that the Epitaph said the wash where the attack took place was "about a mile." It was in this wash that the stage was attacked and Bud Philpot was found dead here by Eddie Drew. The map pin marked "Drew's" denotes the true location of Drew's Station, and the red line added to the map shows a small portion of the original roadway. Near the top of the photo is the TTR/Sosa foundation which Mrs. Sosa has identified as Drew's Station. Note how close the actual Drew's Station is to Philpot wash, and how far the TTR/Sosa site is from the same wash. This alone disqualifies the TTR/Sosa site as being the true Drew's Station. The above satellite photo is closer in than the last. The red line marked at the bottom is a portion of the stage road, which you will see again near the top of the photo as well. Between those red lines is a distinct line on the ground with substantial mesquite tree overgrowth, with blue lines on either side to help the reader locate this. We believe that this is a continuation of the stage road, as it lines upwith the other portions we have documented on foot and with GPS, but the overgrowth is such that even on the ground the roadway cannot be followed in this extended grove of mesquite. The light purple line marks the TTR ravine/wash which Mrs. Sosa believes is where the stage robbery took place, and her exact point of attack is marked by the dark purple pin. But heading north from her stage attack site is the TTR/Sosa road marked by the yellow line, which clearly meanders and remains on the wrong side of the wash she has identified, from the very sites she has identified. Further, it is not part of a route running from Contention to Benson. The TTR/Sosa wash as identified does not intersect the actual route to the TTR/Sosa sites as identified. This simply defies reason. The above satellite photo is closer in than the last, showing the same TTR/Sosa area of sites. The above satellite photo is the closest in of theTTR/Sosa site area, showing an eye alt 6185 feet. At this close a range the TTR/Sosa roadway is really shown to have no relationship with the TTR/Sosa sites. The portion marked in red of the actual stage road does not intersect the TTR/Sosa ravine/wash, as it nearly parallels it in the very area which it should have intersected when traveling north from Contention to Benson. This is the TTR/Sosa road as it exits the wash/ravine headed North. This same section of road, 2.15 miles North of Contention can be seen on the History Raiders Web Site. The wash/ravine runs beside the road to the west making a second crossing necessary to reach the TTR/Sosa Site. It’s troubling that the Sosa article would lead it’s readers to think that this is the first time anyone has offered a site that could have possibly been Drew’s Station, when this is clearly not the case. 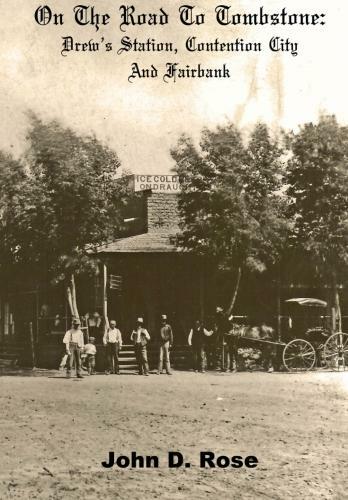 The site on my Drew’s Station page was published three decades ago in Al Turner’s “The Earps Talk,” and I published the same site on this website in the first half of 2010. Sometime TTR attendee, Troy Kelley, showed a picture of the correct Drew’s Station site on page 15 of “From Tombstone to their Tombstones,” published in 2002. I am grateful to count Mrs. Sosa and other TTR members among our readership. But her article closes with this statement: “The location of Drew’s Station is an exciting and important find for history enthusiast. It gives everyone an opportunity to stand where history took place. Using officially recorded documents and maps the location of Drew’s Station was found by History Raiders [the name of her historical research business] and shared with many Tombstone Historians, Authors and Aficionados.” Though this claim was publicly made, it has not been publicly substantiated. The TTR/Sosa road does not even go to their sites; their road is on the wrong side of their wash/ravine. Their route adds mileage and elevation climbs over rough terrain that would only make this journey for passengers and horse team alike far more difficult than needed. The actual stage road was wide enough for two stages to pass each other, proven by the fact that the N. Smith Fast Freight line passed Bud Philpot just minutes before he was shot (see our Drew’s Station page listed under Historical Sites). But the TTR/Sosa roadway is far to narrow for that, and satellite imagery clearly shows that this meandering roadway is not any part of a route from Contention to Benson. Without offering primary sources and proof, Mrs. Sosa’s readers are offered claims of the highest confidence with nothing to back them up except that she and Bill Evans are in agreement. Bill Evans' research is addressed in detail on our “Cottonwood Spring” page. In the past, many in TTR have publicly urged others to back up their research claims by showing their sources, and I applaud them in this effort for full disclosure, but in this case, their public calls for publishing of sources are conspicuous by their absence. The TTR/Sosa sites have value as any historical sites in Cochise County. However, they have nothing to do with Drew’s Station and the very famous events that occurred near there on the fateful night of March 15, 1881. The established site for which we have shown sources and research stands as the site which best follows the primary sources. A TTR member at the TTR/Sosa Adobe wall, one mile from the correct wash, and the Epitaph says 200 yards. This link takes you to a photo of a TTR member sitting atop the TTR/Sosa Adobe wall. This link shows a photo of the TTR group led by Mrs. Sosa heading due west before turning to the right(north) to head to the TTR/Sosa sites. The correct wash and Drew's Station site are to the left(south) of the dirt road on which they are seen hiking in this photo. This link takes you to a photo of TTR Chairperson Jennifer Lewis at the TTR/Sosa adobe as members discuss the site. This link takes you to a photo of Nancy Lewis Sosa (standing on the bench) as she and Jennifer Lewis(just to Sosa's right) ready the assembled TTR group just before heading to the TTR/Sosa sites. This is a different stone foundation we found that is 137 yards South- east of the TTR/Sosa foundation and 80 yards Northwest of their robbery site. "New Drew's" update as of February 16, 2011. Since I published the “New Drew’s?” article, I've been asked why Mrs. Sosa of TTR still has yet to share her sources as we have, and also why her article which we have proven contains mistaken conclusions still remains on the web. For years it has been accepted that Drew’s Station was a known location, but now Mrs. Sosa has called into question this accepted site. Nothing wrong with challenging known history, but doing so means you should show your sources as this is the responsible way to dispute known history. But Mrs. Sosa’s article doesn’t even acknowledge the earlier site, nor does she share her sources in her internet article. Further, she implies she is the first to offer a Drew’s Station site, which is clearly incorrect and widely known. I have also been asked why some in TTR are now selling a $15.00 commemorative poster which mentions that Mrs. Sosa led TTR to Drew’s Station, when we have proven in detail that the TTR/Sosa sites which they visited are not Drew’s Station nor Drew’s home, nor is the TTR/Sosa Robbery site correct either. While I believe these really are questions for Mrs. Sosa and TTR, I will now address certain aspects of this for those of our many readers who expressed interest in this. I will also offer a few thoughts on historical responsibility when calling into question established historical sites as Mrs. Sosa has. In the past many in TTR have urged others to share their sources to back up their research claims, and we have publicly applauded them in this effort for full disclosure, but in the case of TTR member Sosa, TTR members remain mute on the web and are not publicly urging her to publish her sources on her Drew’s Station research and locations. This is puzzling given how aggressively many in TTR have urged non TTR members to share their sources. Sharing her sources on the internet for all to see and proving her claims now that she has disputed an established historical site is Mrs. Sosa’s responsibility to the greater historical community. Today, February 16th, 2011, two and a half months after we first published “New Drew’s?”(on Decmeber 30th, 2011) with sources, I again urge Mrs. Sosa to publish on the net her primary sources and prove her claims. Just sharing her sources in Tombstone is not the same as publishing your sources on the net for all to see,(as we have done)and it’s not fair to so many Tombstone enthusiasts and historians who are unable to travel to Tombstone as much as they wish they could. The Drew’s Station site which we have endorsed has been established as correct for three decades, and we have shown convincing primary sources for that location. It was TTR Chairperson Jennifer Lewis and Mrs. Sosa’s who opened this discussion and made claims of the highest confidence and authenticity about the TTR/Sosa sites on the internet, but without any proof? It was Ms. Lewis who claimed on the net that Mrs. Sosa had discovered the correct location of Drew’s Station, so why not share the proof on the internet? Mrs. Sosa claimed that she could prove “100% without a doubt” that her site was authentic. Why not do so and do so now, and on the internet? But because of these claims, an accepted historical site of the importance of Drew’s Station has been called into question by Ms. Lewis and Mrs. Sosa’s claims, but no primary sources/proof is offered. Without publishing primary sources and proof, such unsubstantiated claims do a disservice to known body of historical information, calling into question an historical site that really is the correct location of Drew’s Station. By placing her sources on the net now she complies with her own words as quoted above. Otherwise, she is contradicting herself.